This year, I really wanted to use what I have a buy less. The modern woman typically has more clothes, shoes and accessories than any of our grandmothers did. They used their crafty talents and smart style to create different outfits from just a few pieces. edit: If you don't have a suit, you can pair any skirt with a blazer, jacket or cardigan! 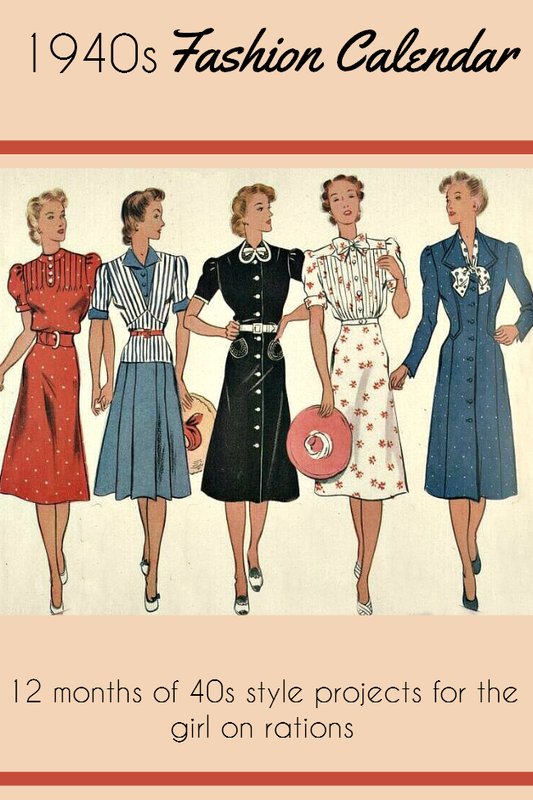 The book recommends a suit because that was typical for any lady in the 40s but we're modern girls so don't be afraid to get creative and make the look your own! My "suit" is a thrifted navy 70s skirt and a 40s jacket. Definitely not matching but they're both navy so it works for me! These items can be vintage or modern, new or something from your closet already. This is a great opportunity to wear some of the boring, plain things that get stashed in the back. To complete the look, you'll want a simple pair of comfortable shoes. I picked two- thrifted brown loafers and black t-straps with a low heel. What a wonderful idea. I am excited to see what is to come! Oh I'm intrigued to see what you make each month, can't wait to find out! This sounds great! I'll be joining in! Love, love, love this! I will try and join in when I can! P.S. Who won the giveaway? Oh this is fun! I can't wait to see how you progress with this! I think I'll join ya in the fun as well. This sounds awesome! I don't have some of these pieces but I love the idea of this. Will definitely try to play along! Great idea! Can't wait to join in the fun. Fabulous idea ~ I so want to try and play too! It might be a bit hard as I am missing the suit and the dress components, but then again, these things aren't bad to have in you closet, so I might just see if I can make them up or find them! This sounds like a fantastic idea. It's strange how much putting some limitations on yourself can really spur your creativity. I'm sure you'll come up with some great outfits to inspire us. What a great idea! I look forward to all of it! Sounds like a great idea, I'll definitely have a go at joining in. Seriously awesome idea, sweet gal! Such a good plan, am looking forward to it.